Daniel Marzona is pleased to announce the second solo exhibition of Bernd Lohaus. Bernd Lohaus’s oeuvre gives a voice to the material. Since the late 1960s, wood, rope, and later also stone and bronze have been the working materials of elemental sculptures in which the raw and the fragile interlink and in which flotsam found in the water gains a new artistic life of its own with a few simple interventions. Along with the usually block-like and expansive sculptures stand reduced works on paper and raw canvas pieces – “coudrages” – with similar, powerfully expressive simplicity; some are inscribed with a few words as if with pictorial poetic exclamations, while in other cases, they are marked with bar-like brown strips of tape that cut out space, sometimes accented with energetic strokes of color. The artistic intervention is thus reduced to simple actions. In this way, the works are characterized by a very delicate effect. The works are created against the background of Fluxus, social sculpture, Arte Povera, Minimal Art, and Material Art and have their own unmistakable site in this historical neighborhood. At the center of this sculptural oeuvre stand the ensembles and individual pieces made of heavy beams, boards, blocks, and cubes of azobé (red ironwood), West Africa’s hardest wood. Lohaus’s studios were warehouses and laboratories at the same time. With few changes, like notching or inscribing with chalk, the found wood was made as if to vibrate, to resound, to speak. 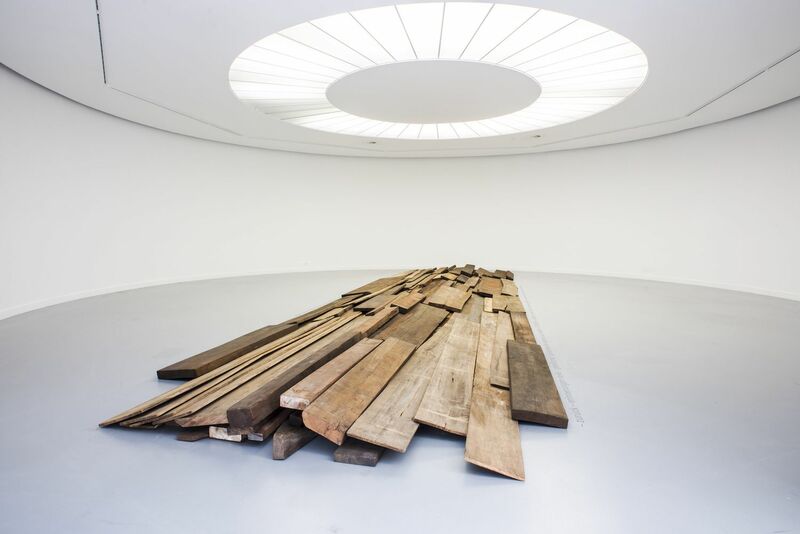 Old used wooden beams, wooden boards, and sometimes old ropes are a special kind of flotsam: originally natural materials, at the same time they transport a bit of human history that has been materially weathered into them. These beams and boards are both object and subject: they embody force and are exposed to forces; they shape and incur; they are the sediment of human history. Because the material points beyond itself to the realm of feeling, thinking, language, and back to history and nature, Lohaus’s sculptural oeuvre is an expansion of traditional sculptural forms of expression. It connects the material with spirituality. Bernd Lohaus created his first works directly in Beuys’s class, and they were exhibited in the gallery circuit of the Academy at that time. Since then, in its various forms of expression, the oeuvre has continued to develop in the sense of a progressing dialog with itself and the world. Lohaus has also repeatedly placed large ensembles in natural surroundings.